The NuForce BE Sport3 features excellent sound, build quality and battery life. Overall, they're one of the best wireless headphones you can buy, even if you don't work out. Many of us have had mixed feelings about the rise of wireless earphones, given their previous reputation for poor sound, short battery life and interference. But today, wireless headphones are pretty darn great, and there's no better example of that than the wireless buds on display here: the Optoma NuForce BE Sport3. With flagship iPhone and OnePlus handsets seeing fit to ditch an analogue headphone jack entirely, we're moving closer towards a brave new world of solely wireless headphones, and more and more of you will be looking to find the best examples of tomorrow's wireless technology. The BE Sport3 are, beyond a doubt, one of the best wireless headphones on the market and we wholeheartedly recommend them for anyone who wants a pair of wireless earbuds that do it all. Physically, the NuForce BE Sport3 and NuForce BE6i look completely different but both are made with aluminum and rubber. Both pairs of headphones feel extremely solid, especially since the earbuds themselves are milled out of aluminum. They're also magnetic so they won't flop around on your chest when not in use. The most dramatic design change between the two headphones is the earbud nozzle, which is the part that actually goes into your ears. I found the BE6i a bit too big, which made finding a good fit tricky, even with all the included eartips. The angled nozzles on the BE Sport3 allowed me to insert the earbuds deeper for a better fit. 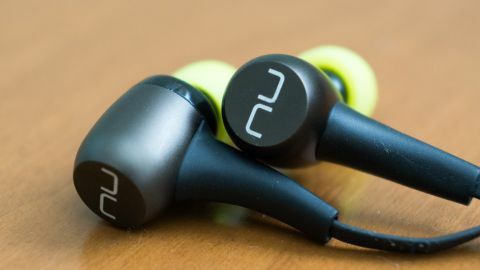 Optoma NuForce still includes a ton of eartips in the package so most people will find a fit they like, and there are even wing tips to keep the earbuds stable during physical activity. Speaking of workouts, the NuForce BE Sport3 headphones are IP55 rated, making them rain, dust and sweat resistant. You won't want to go swimming with them, but they should put up with your abuse at the gym. And although the BE Sport3 headphones are targeted at those with active lifestyles, nothing about its design screams "workout" headphone except for the pink and yellow eartips, which you can swap out.for stealthy black ones. Once you find a good fit, you'll be treated to balanced sound that works well for every genre and incredible noise isolation. Although the BE Sport3 aren't the last word in resolution or dynamics, I found it's slightly boosted bass response and rolled off highs good enough, especially when you consider these headphones cost $79 (approximately £64, AU$106). Up against the competition, the NuForce BE Sport3 offer a tremendous value. One of the most popular wireless workout headphones, the Jaybird Freedom Wireless, offer worse sound, 4 hours of battery life without its charging cradle (the NuForce gets 10 hours) and frustrating fit. To make matters worse, the Jaybirds cost over twice as much at $200 (about £150, AU$260). NuForce knocked it out of the park with the BE Sport3 headphones. They're an incredible value for a pair of wireless headphones that sound good, last all day, have a bulletproof build and incredible noise isolation. While they're not the most dynamic or resolving headphones, NuForce shows us that the future of wireless headphones is a bright one.